Is it a snapshot or artwork? I was in a conversation recently where someone asked, “what is the difference between a snapshot photo and a photo that is a work of art?” That subject motivated me to see if I could take a photo of something very simple, in this case a pencil, and create a photo that was more a work of art than a snapshot. The following is my process and what occurred. 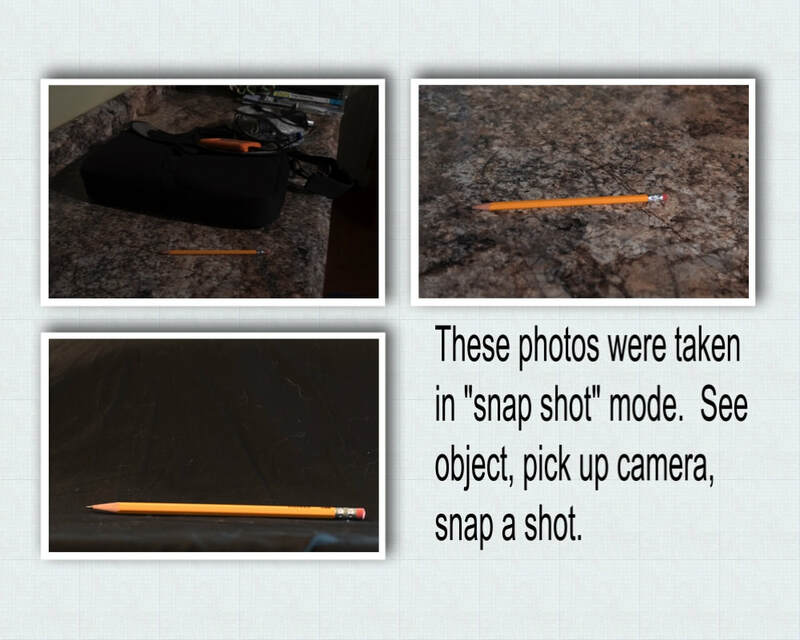 I explain the process in the text below and then show in picture format the photos that occurred from the process. 2. I move the pencil, in this case (which stands for any scene or object) and move my body. Now I’ve removed anything that was in the photo that did not help me “tell the story” or did not add to the scene in some meaningful way. I try again. I snap the shot. Did it work for me? 3. If not, I need to determine what to do to get the shot I envision. I take out my tripod and change lenses. Now I’m using my Nikon 105 macro lens, the initial shot was taken with my Nikon 24-120. I look at the pencil and try to figure out what I like about it; I decide it’s the lead on the pencil, even though it was the color yellow that I initially liked. My vision is moving around and growing as I work. I get a black cloth out (actually a king sized black sheet) and put it on a table, putting a box under the sheet as a back for the pencil so that the back is black, too. I take a straight-on shot, getting it all in the shot. I examine the shot. For me, it did not work out well. 5. 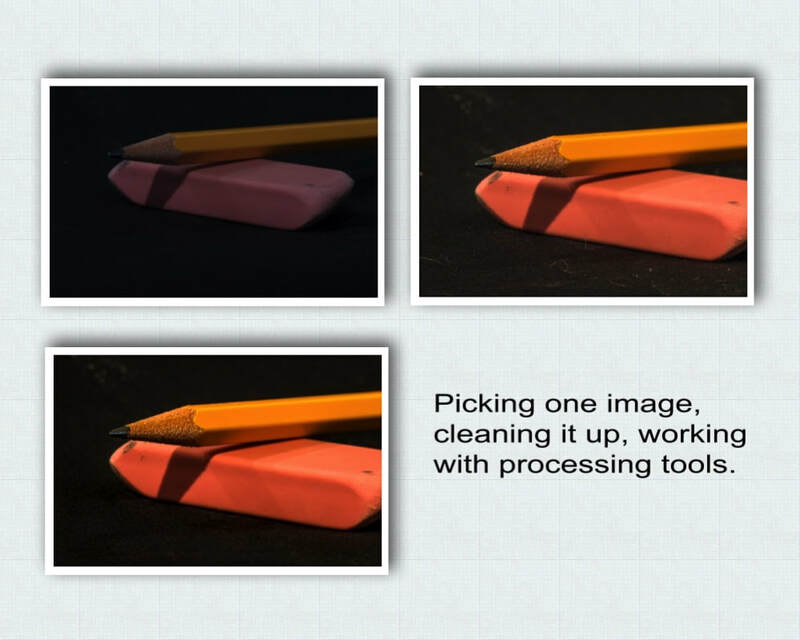 I put an eraser into the scene, they generally pair up and the story then becomes a pencil writes things and the eraser can erase them, but then how to set up the two items? I try a couple of different settings and change aperture (to determine depth of field with both objects) and exposure as needed. The light has changed in the window so I no longer have to use the folder to control the light (pretty high tech equipment!). 6. I look at where the shadow falls across the eraser, which I like as it creates more of a 3-D feel (some people do not like shadows on their objects but I do) and I want the shadow to fall differently. 7. 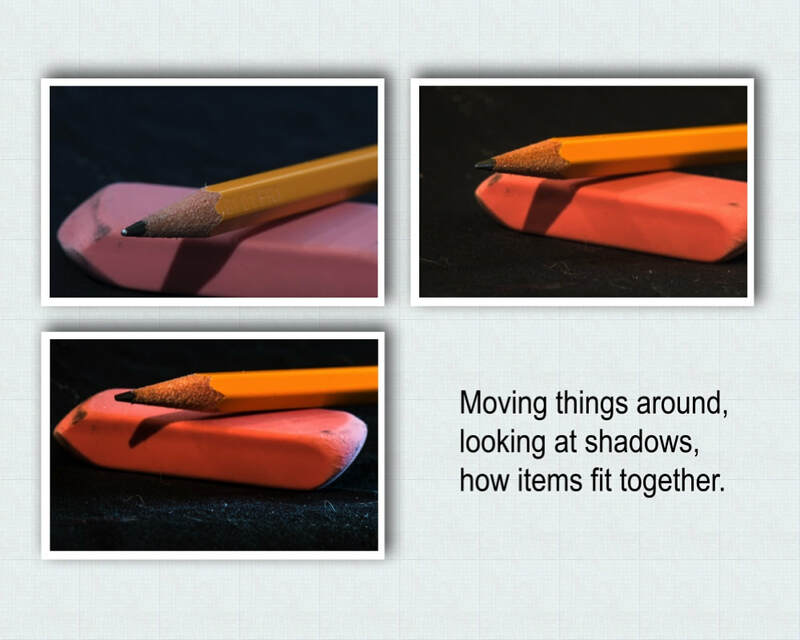 I’m happy with the setup of the eraser and pencil; I like the way the shadow falls, how the pencil sits on the eraser, and where the placement of the objects are in the photo. So, maybe I have something to work with to create a piece of artwork. 8. I download and view the photos and find out that my exposure was off, a bit too dark, this is because I was shooting at a minus exposure to keep the black background as black as possible. But, I can correct that in Lightroom. 9. Since I took several shots, I can find the one I like the best in the Library Module, which ends up being a shot with the shadow falling all the way over the eraser. It’s not as sharp as I wanted but, overall, it will work for me. It shows the lead of the pencil and all the wood where I’ve sharpened it and the shadows add the depth I wanted in the image. I start to process using the Develop Module. 10. In processing, I do all the usual things such as correcting exposure, highlights, shadows, and setting a black and white point. I do a few things with the white balance, using both local and general white balance corrections. I add some clarity as I generally like things with sharp edges (just my preference) and add sharpening. I also add a tone curve I’ve created that tends to make things “pop.” I also use the Transform tool to enlarge the image as I could not get as close as I wanted to enlarge the image with the lens I was using. Transform does take any pixels out of my image but does add some as the technology enlarges the image without actually cropping it. 11. The image needs a lot of clean-up on the black background because of the type of cloth I use so I go into Photoshop from Lightroom. In Photoshop I clean up all the white spots and lint, I blur the foreground a bit, I do a very slight Burn across the foreground, I do a High Pass sharpen filter as an overlay. I leave the eraser looking worn as that is part of my story about how often I erase! 12. I like the end result much better than my first snapshot. 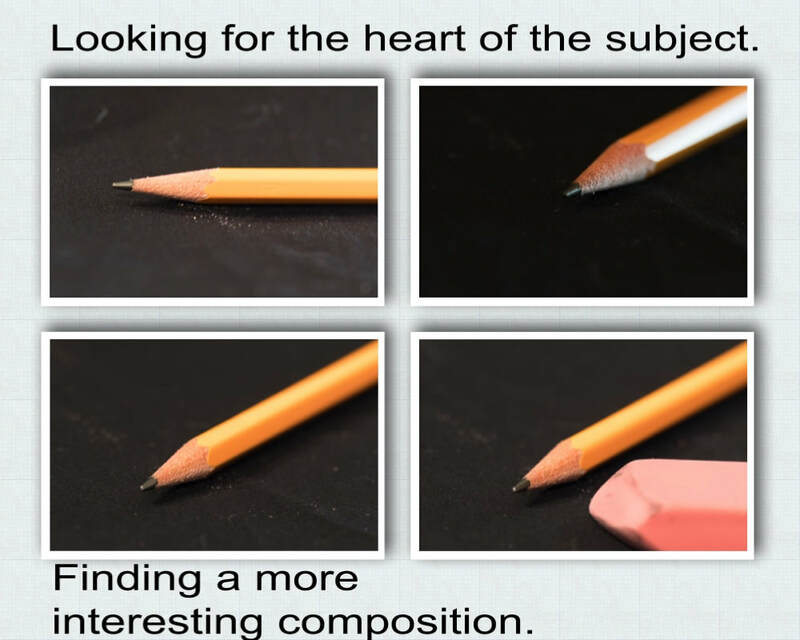 I think it shows a pencil that is interesting, the image holds my attention as I look closely at the tip and the wood that was sharpened, and I like the bright but deep yellow of the pencil and the well-used eraser. 13. Can I do something else with it? I turn it into black and white, not bad, seems to work out ok. I try it in PicSketch (mac program, from mac store), nope, takes away from the image. I try Topaz Simplify and work with one of the filters in the program until I like the result, it is a bit more dramatic but does take away from the sharpness of the image a bit. 14. So, that is my process of going from snapshot to work of art for a photo with any subject, an object or a landscape. Look at the scene, figure out what you like about it and why you are taking the photograph, work the scene in different ways, change exposure and aperture, change the scene position by moving the object or moving your body, up-down, one side or the other, and then work with the image choices in post processing to create the best possible image you can. Know what you can and cannot do with the photo when you begin to process it in Lightroom.